First named the Leon Fraser, this 520-foot lake freighter is simply beautiful. The ship spent most of its life hauling iron ore throughout the Great Lakes. In 1991 the Leon Fraser was sold to Inland Lakes Management. The ship was renamed Alpena that same year and modified at the Fraser Shipyard into a cement carrier. In 2015 Alpena almost met its end when a fire broke out in the ships aft end causes by old wiring. 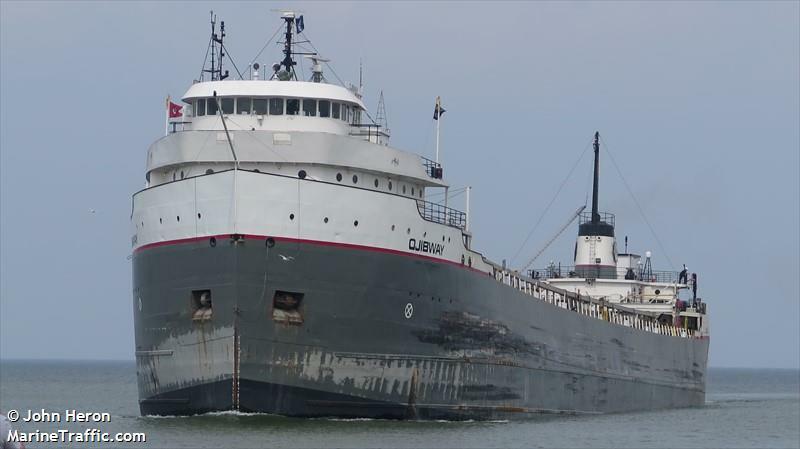 Fortunately, despite $3 million dollars in damages, the Alpena was repaired and is currently operating on the upper Great Lakes. This ship has been one of our favorites to track along the St. Lawrence Seaway and whenever she sails through the 1000 Islands Region. OJIBWAY was built in the early 50’s and entered service in 1952 under the name Charles L. Hutchinson. It was built by the Defoe Shipbuilding Company in Michigan. The ship spent its early years hauling iron ore.
Over its extensive career the ship has undergone multiple ownership and name changes. The Charles L. Hutchinson was renamed the Ernest R. Breech after Ford purchased the ship from Pioneer. In 1988 Kinsman Lines purchased the ship from Ford and it was renamed the Kinsman Independent. In 2004 McKeil Boats Limited purchased the ship and once again renamed it. This time the Voyageur Independent. 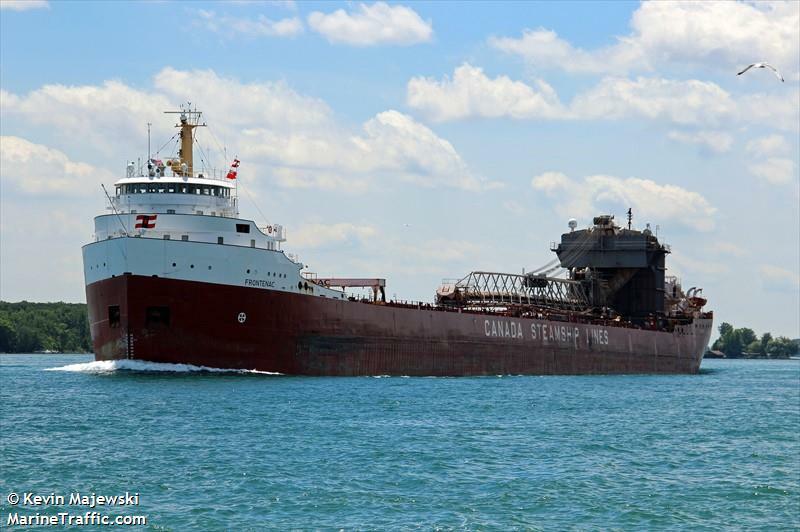 In 2007 Lower Lakes Towing Limited purchased the ship and in early 2008 registered it under its current name OJIBWAY. If we could only use an image of one ship to describe a classic lake freighter, it’s a good chance that image would be of the FRONTENAC. Aside from the stern mounted unloading system, the front bridge, red hulled, Canada Steamship Lines freighter fits the bill perfectly. Launched in December of 1967, the FRONTENAC started its life as a classic straight decker and had the unloading system mounted a few years after. The ship has had quite a career. 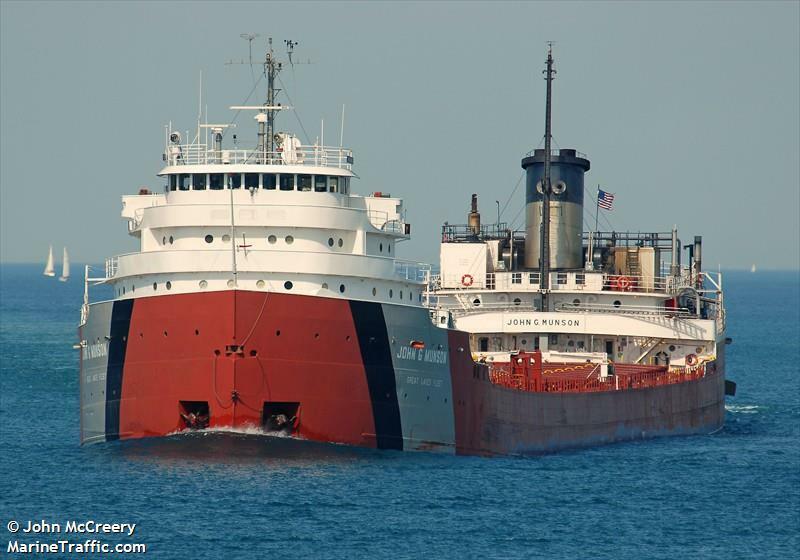 It was one of several vessels involved in the search and recovery efforts of the famed Edmund Fitzgerald in the days following its tragic sinking. In 1977 the ship was grounded on the St. Lawrence and was forced to remove 5,000 tons of cargo to be released. In 1989 the FRONTENAC was involved in a collision with a tug boat on Lake Erie. 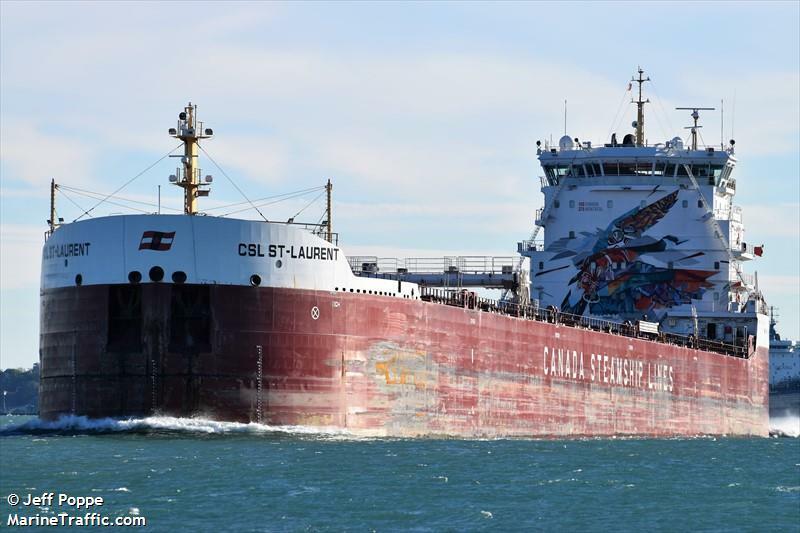 In 2002 the ship once again aided in a rescue when a speed boat sank on Lake St. Clair. Another ship built in the early 50’s, the John G. Munson set sail on its maiden voyage August 21st, 1952 and was built in Wisconsin by Manitiowoc Shipbuilding, Inc. Unlike the FRONTENAC, that started as a straight decker and had unloading system installed later, the JOHN G. MUNSON had one installed from the start. The ships started its career transporting limestone and set a Great Lakes limestone cargo record. In 1976 the ship was extended by 102ft. The JOHN G. MUNSON sports a beautiful paint job that is shared by other ships in the Great Lakes Fleet. If you like the JOHN G. MUNSON we strongly recommend you keep an eye out for its peers. Our favorites are the ROGER BLOUGH, ARTHUR M. ANDERSON, CASON J. CALLAWAY, & PHILLIP R. CLARKE. We are rounding off our list with the CLS ST LAURENT. Just last month we stood on top of the US span of the TI Bridge for over an hour just to get some footage of her. The ship sports the iconic red hull with white Canada Steamship Lines lettering. Compared to other ships on our list this one is brand new setting sail on its maiden voyage in 2015. A sign of the times, the ship was built in China by the Yangfan Group Ltd. The ship sports all of the most modern equipment and is more fuel efficient with less emissions. In 2017 a beautiful mural was painted on the ship as a tribute to Canada’s 150th anniversary and the City of Montreal’s 375th. The mural is titled The Sea Keeper and depicts a Canada goose in flight. So, there you have it! 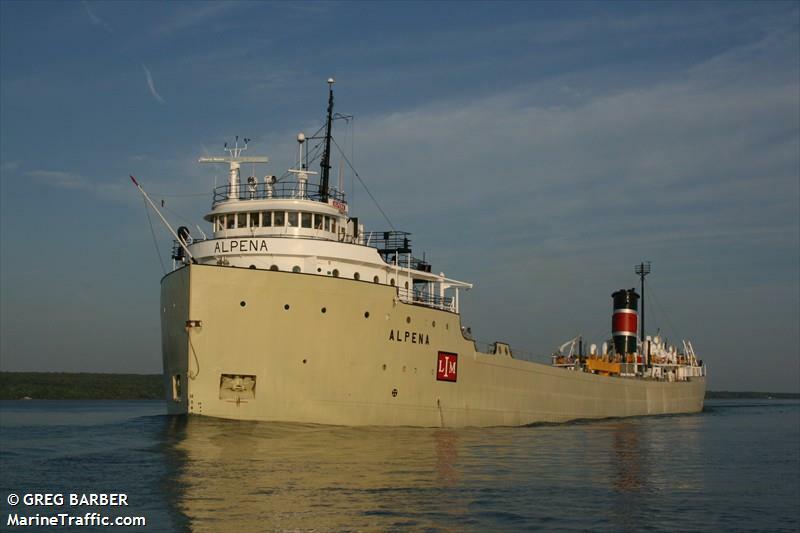 The top five lake freighters we at Captain Spicer’s Gallery suggest you keep on your Radar. Now this list could have easily included 15 more ships. The CSL TADOUSSAC, CUYAHOGA, HON.JAMES L. OBERSTAR, MICHIPICOTEN, ROGER BLOUGH, ARTHUR M. ANDERSON, CASON J. CALLAWAY, PHILLIP R. CLARKE, LEE A. TREGURTHA, KAYE E. BARKER, & a few other where all strongly considered. If you are a mariner on any of the ships in this list, please feel free to reach out to us on social media! We love hearing from you and thank you for operating these Titans of the Great Lakes. ALL IMAGES USED IN THIS ARTICLE CAME FROM www.marinetraffic.com.